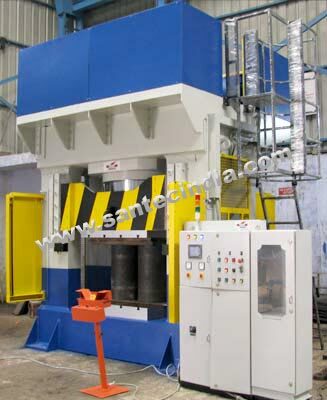 'SANTEC'  A leading name in manufacturing of Hydraulic Presses introduces these presses, operate at high speeds with high level of precision because of 8-point gib guided slide. The square gib construction provides accurate guiding of the moving platen/slide with extra stability to resist any deflection under different load conditions. Applications:-Mainly for sheet Metal Jobs, Blanking, Deep Drawing, Riveting Trimming etc.